It’s finally fall! With the weather turning, cozy evenings in, and leaves changing colour comes one of our favourite holidays of the year, Halloween. It’s easy to get caught up in the busy fall season and costume making and forget about another important aspect of Halloween. Don’t forget to adorn your home with DIY Halloween decorations! 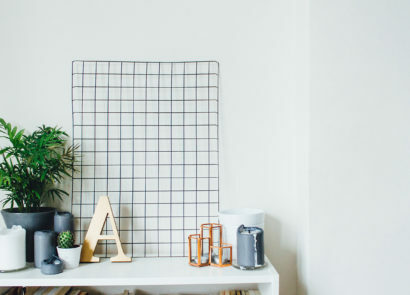 There are lots of easy DIY Halloween decorations and crafts that can elevate your home from its everyday aesthetic to a grisly haunted house, a mysterious graveyard, or an eerie scene from your favourite Halloween movie. If you’re decorating for Halloween in a hurry or on a budget, these 5 DIY Halloween decorations will do the trick—and don’t involve carving pumpkins! The possibilities are endless! 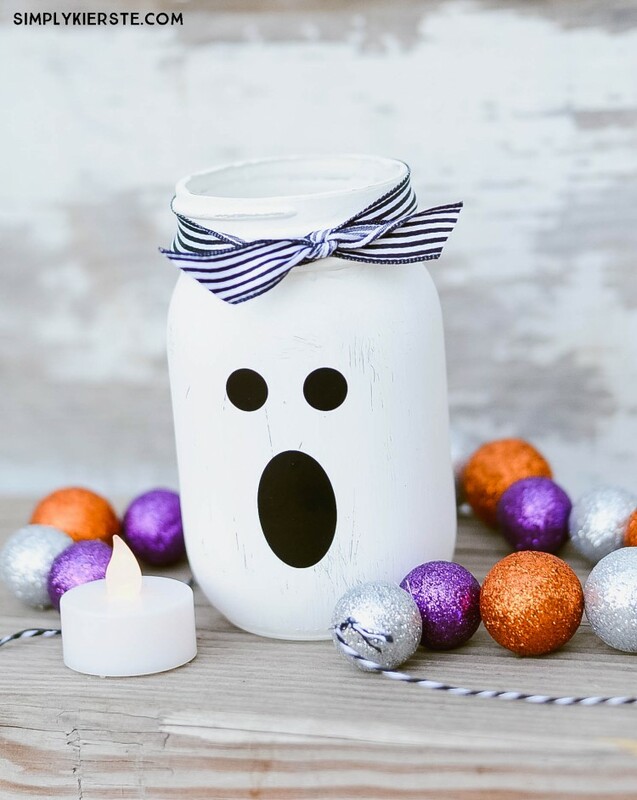 From painting jars ghostly white (see Simply Kierste’s tutorial) to putting a tea light inside to illuminate an eerie face, mason jars are a wonderful addition to your decor because they are so multi-functional. They can store Halloween candy, prop up dried flowers for a centrepiece, and even act as a lamp that lights up your space. If you’re looking for a DIY that is seasonal but not necessarily Halloween related, try spray painting some sticks black for a mason jar centrepiece. We’d also suggest this tutorial on painting fall-themed vases. Remember: all household paint, including paint aerosols, are recyclable in every province. Find a drop-off recycling location near you using our recycling locator! With colder weather often comes mandarin orange season…and tiny mandarin pumpkins. They are easy to make, the perfect Halloween colours, and a healthy alternative to candy at the end of the night! All you need for this craft are sharpies and oranges. 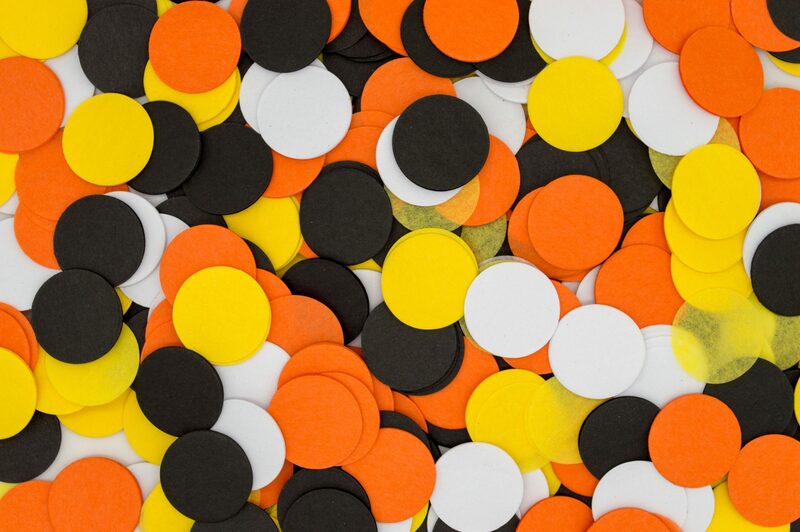 If you have paper or felt, you could craft your mandarins little witch hats, or if you have white spray paint, you can turn your mandarins into Halloween ghosts! 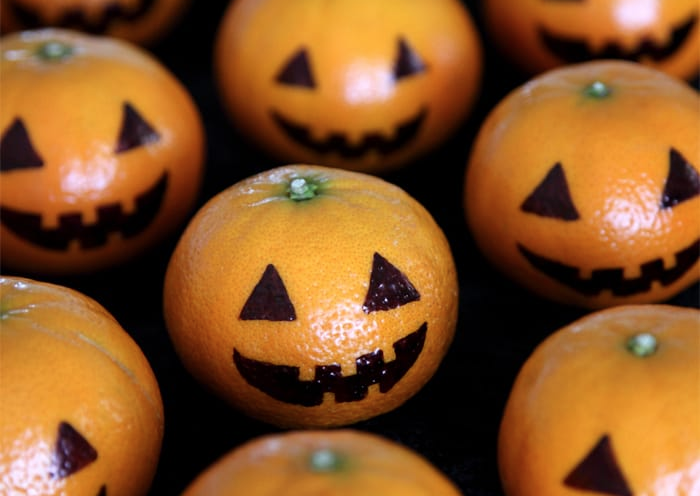 Check out Design Intuition’s post on these fun oranges. Ping pong and eye ball enthusiasts rejoice! 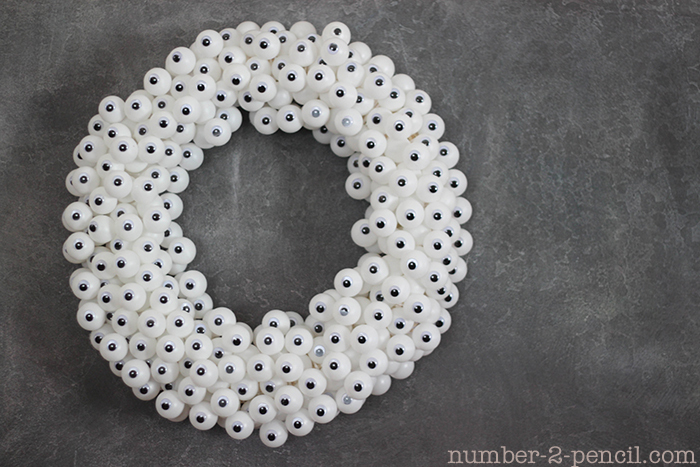 This googly eyes wreath by Number 2 Pencil is the perfect scary (but not too scary) craft to try out with your kids that can be hung from an exterior door. The wreath pictured above uses about 250 ping pong balls, but you can design your wreath to be any size or shape. Bonus: this craft is eco-friendly! You can reuse your wreath for next year’s Halloween and maximize its creepiness by spray painting the eyes red or black, or gluing spiders and spider silk onto it. Have an extra witch’s hat from an old costume? 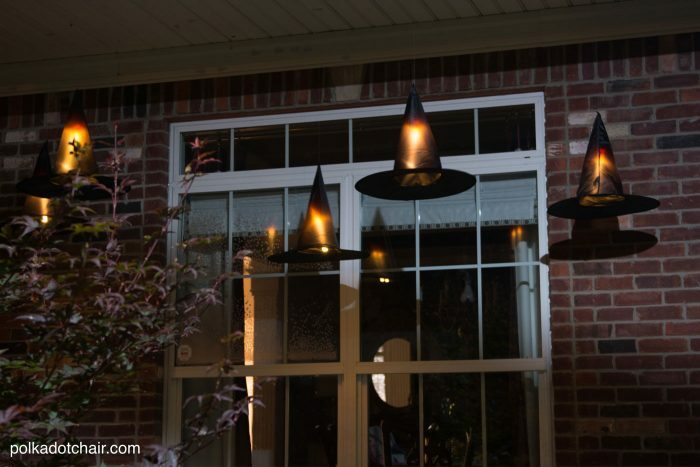 Then all you need is electric tea lights, or an existing chandelier in your living space to make these witch’s hat lights by Polka Dot Chair. Goodbye rustic chic—hello spooky! We’d recommend checking out your nearest thrift store to see if they have second-hand witch’s hats—you’ll save money this way too. 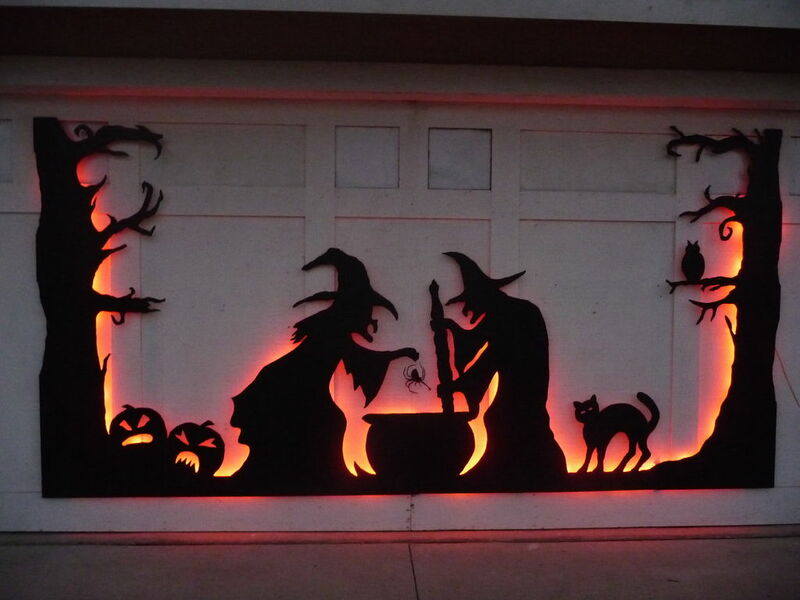 If you’re feeling extra adventurous and have a blank wall or garage door at your disposal, you can also try cutting out silhouettes of ghosts, witches, or black cats and line the scene with string lights. 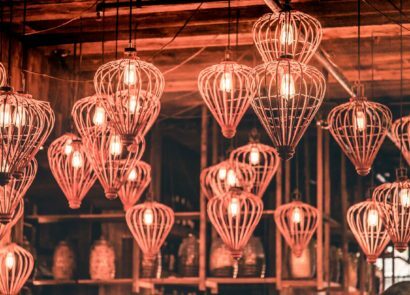 In BC, you can recycle old lighting fixtures like chandeliers, string lights, and even portable lights like electric candles. Find a drop-off recycling location near you here. From a googly eyed minion to a green cyborg or goofy ghost, there are an infinite number of ways you can craft a monster door. We love Twin Dragonfly Design‘s door, as seen above. 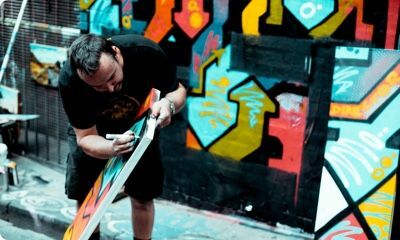 You may not need to buy anything at all for this project if you already have craft paper, tissue paper, and paper plates in your craft arsenal. 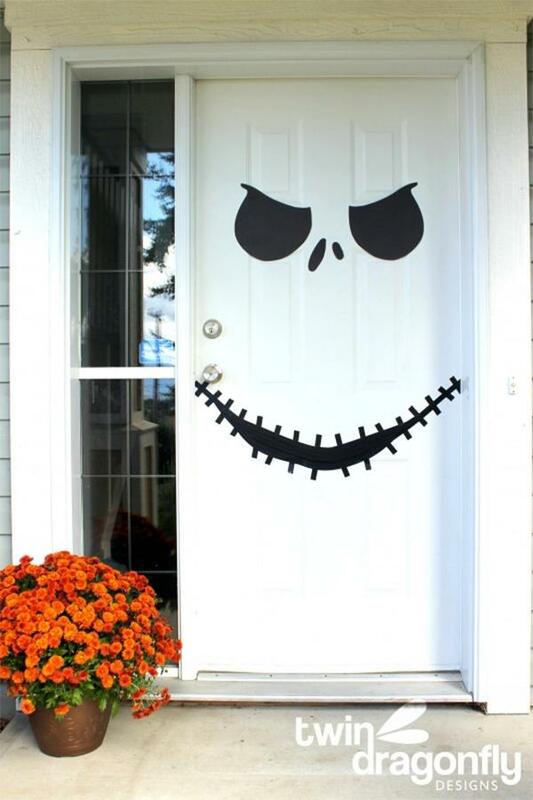 While these doors are great for houses and town homes, they also make for a fun day-of class Halloween project at school. Even better: you can recycle your leftover paper and paint, making this craft zero waste! Have you made any Halloween decorations with your family this year? Send us your pictures on Facebook or Twitter and make sure to recycle your leftover paper, markers, and paint. If you are unsure what locations near you accept household paint and paint aerosols for recycling, visit our collection site locator.